A few months prior to Boo’s birth, Lu gave birth to my precious nephew, Peanut. Lu had a Sleepy Wrap and told me how much she loved it. That testimonial was all I needed to invest in a Sleepy Wrap of my very own. Over the last two years, I’ve tried several different types of carriers, and hands down, the wrap is my absolute favorite for wearing a newborn. In fact, I could not wait to get Baby Girl in my Sleepy Wrap after we got home from the hospital! Let’s start with the basics. The Sleepy Wrap is one long (5.5 yards) piece of heavy, high quality, stretchy knit fabric that you wrap (thus the name) around your body and tie at the waist. 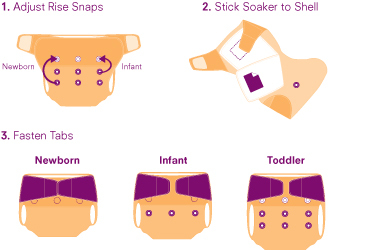 Your baby sits on the “x” formed by the crossing pieces of fabric as you tie the wrap around you, and then you pull the front panel up over baby’s bum (see tying methods). This swaddles baby close and secure at your chest. With Boo, I used the wrap on the go and at home. Because he had reflux we had to keep him upright or he was screaming (pretty much all.the.time). There were many days in his first year of life that the Sleepy Wrap saved my sanity (due to the decrease in screaming) and was the only way I could get anything done around the house. It was also just about the only way he would nap for the first few months. Now that Baby Girl is here, I have three children ages three years and under which means that I don’t have enough arms to keep up with everyone when it’s just the four of us. I must have Baby Girl in a carrier for any trip, activity, or errand where I will have all three kids out of the car. I wore Baby Girl in the Sleepy Wrap for the first time at 3 days old when we made her first pediatrician’s office visit. It was so nice to know that the baby was safe, secure, and snuggly in the wrap while I wrestled the other two in and out of the car and building! There are several things that I absolutely love about this wrap. The material is soft and comfortable for mom and baby, the stretch of the fabric makes it easy to get baby in and out, it keeps baby snuggled close to me while my hands remain free to handle my preschooler and toddler, it makes baby feel safe and secure, and my babies sleep well when in the wrap. 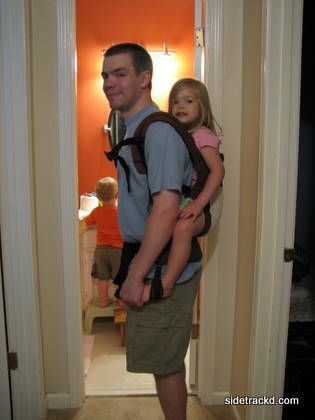 I also like that I can tie it on before I leave home and just get baby out of the carseat and pop her into the wrap at each of our stops instead of having to put on and take off a carrier each time (or even worse, lug the heavy and cumbersome infant seat everywhere). Most of all I love to be able to bend my head and kiss the top of that sweet little baby head, because, really, can you ever get too much of that? I’ve found very few drawbacks using the Sleepy Wrap over the course of these two years. The biggest one is that, due to the weight of the material and the fact that my wrap is black, it gets hot on me and baby when we are outside for an extended time on a hot, sunny summer day. The only other one I would say is that due to the stretchiness (is that a word? it is now) of the fabric it gets looser as the day goes on and as baby gets bigger. Neither one of these are issues that can’t be easily solved (by taking the wrap off every now and then (like when you stop to nurse) on hot days and tying it tighter to compensate for stretching), and certainly wouldn’t affect my recommendation of the Sleepy Wrap. Literally, just about every time I’ve worn my Sleepy Wrap I’ve received inquiries about and comments on it, and every time I’ve told the person how great this product is. In fact, several of my friends have used them after seeing me in mine and hearing about it. So, in conclusion (because I haven’t used enough words already), I would (and do) whole-heartedly recommend the Sleepy Wrap! It makes a great carrier for first time babywearers because it is easy to use (really, it isn’t nearly as complicated as it looks) and is wonderful for tiny babies right on through infanthood (and into toddlerhood). If you are expecting or know someone who is, a Sleepy Wrap would make an excellent shower gift. If you’d like a chance to win one, the wonderful folks at Sleepy Wrap have given me the opportunity to sponsor one of their great products as a prize at Ultimate Blog Party 2010 (prize number USC 61). Thank you Sleepy Wrap for making a great product! Disclaimer: I received no compensation (either monetary or products) for writing this review. I truly do love my wrap and am thrilled to be able to share one with another mom via the UBP’10 giveaway. Congratulations to commenter number 5, Amanda W who said: This would be great to have with flu/cold season coming up. Random.org has generated your number as the winner of the Temple Touch Thermometer giveaway! I have sent an e-mail to the address you left with your comment. Thanks to all who entered the giveaway. I hope everyone has a safe and healthy cold and flu season! A few months ago I was given (free of charge) a Gro Baby shell set to try out with Boo. I must say I love the Gro Baby diaper – the ease of snap-in liners versus “stuffing” pocket diapers, no problems with leaking (even overnight), and a trimmer fit than our Fuzzi Bunz. In fact, Matt likes the Gro Baby system so much better that he has requested that we use them with the new baby girl when she arrives in a few months. And now Gro Baby has made it even better by introducing their Biodegradable Soaker Pads. Bio Soakers, as they’re known, are biodegradable inserts designed to use when you are out and about, traveling, or any time you desire a liner that doesn’t requiring laundering. 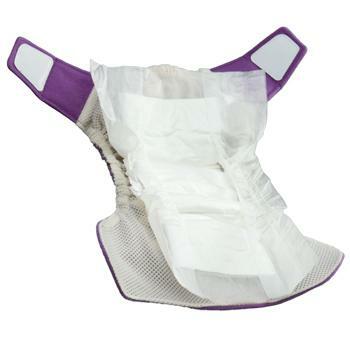 Just like the cloth soaker pads in the Gro Baby system, you can remove the soiled Bio Soaker liner and insert a new liner as needed while using the same shell. The Biodegradable Soaker Pads are made of a soft certified natural, 100% Ingeo spunbound non-woven fabric that touches baby’s skin, a core of biodegradable wood pulp fibers (contains 3 grams of SAP gel compared to 10-20 grams in other disposables), and a 100% natural waterproof outer. They attach to the Gro Baby shell using a sticker adhesive that holds the liner in place without damaging the mesh interior of the shell. Bio Soakers are a great addition to the Gro Baby package, and will be a great addition to my cloth diapering stash. I’m looking forward to trying out this new product! In exchange for publishing this post The Natural Baby Company will provide me with a Bio Soaker Intro package free of charge. Thank you to The Natural Baby Company for providing a quality cloth diapering product and an opportunity to try out their new product free of charge. A few weeks ago I was given the opportunity through MomSelect to review a Temple Touch digital thermometer. When the package arrived in the mail I immediately opened up the thermometer (that they sent for me to keep, free of charge) and tried it out on the kiddos. There are a lot of nice features on this thermometer – a backlit display so you can take temperatures even when your child is sleeping, memory recall, a timer feature, and it can be used on the temple or the armpit – but what I like most is that it is quick, easy, and accurate. It is just next to impossible to hold my children still for the 60 seconds or so that it takes our regular thermometer to register the temperature in their armpit, but the temple touch thermometer registers the temperature in just 6 to 8 seconds. 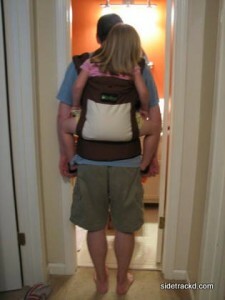 I can even keep the 18 month old still for that long without having to hold him down. Taking a temperature is as easy as pressing the “on” button, waiting for the two beeps, pressing the sensor firmly to the temple (about half way between the end of the eyebrow and the hairline), and waiting for the long beep that means it’s finished. We’ve used the thermometer several times (both with and without elevated temperatures) on the kids, on Matt, and on myself over the last few weeks; every time the readings have been accurate to what I expected. The information that comes with the thermometer states that it “rapidly samples the heat flowing from the blood vessels in the skin surface and translates it accurately to the body temperature” so that you don’t have to worry about adding a degree or remembering to adjust the number in your head so you have an accurate temperature. The Temple Touch thermometer that I was sent is sold at Walgreens and retails for about $20. Having used a regular digital thermometer for the last three years, I’m looking forward to continuing to use the temple touch with Little and Boo as well as the baby girl when she arrives. I would definitely recommend this thermometer for anyone with children, especially small children. And, best of all, MomSelect sent me a second thermometer to giveaway to one of my readers. If you’d like to enter to win, please leave a comment on this post (and make sure I have an accurate e-mail address to contact you if you are the winner). For a second entry, tweet about the giveaway and include @sidetrackd in the tweet. I will randomly choose and notify a winner next Friday, October 22. The random integer generator spit out number 58 which matches to the comment where Stacy says her favorite Starbucks drink is “Just a plain â€˜ol vanilla latte.” Congratulations, Stacy, you’ve won the $5 Starbucks gift card! Thanks to all 265 people who left comments entering the giveaway. It was fun reading everyone’s favorite drink, and I got some ideas for something new to try if I can give up the Pumpkin Spice Latte for a visit or two. A lot of you love the Caramel Macchiato or the White Chocolate Mocha which are usually my standards when Pumpkin Spice is out of season. I was also interested in all the comments about the Salted Caramel Hot Chocolate; I’ve been intrigued by this drink since it was introduced but was scared to try it (ya know, “don’t mess with a good thing” and all). Several of you commented that it is very good, so I’ll have to give it a try. If you came by just for the giveaway I hope you’ll stop back by sometime. I’ve enjoyed having all the company. If you’ve read Sidetrack’d for any length of time you probably know I have a love affair with coffee. Not just any coffee, though; I’ve said it before and I’ll say it again: I’m a coffee snob. I’m all about rich, dark, full flavor coffee, and I love me some Starbucks. And I love this time of year because Starbucks is serving up their scrumptious Pumpkin Spice Latte (or Frappuccino depending on my mood and the weather). In honor of the return of my favorite beverage, I will give one of you lovely people a $5 Starbucks gift card; a chance to try my fave or to get a cup of your fave. Just leave a comment telling me your beverage of choice when you visit the beloved coffee shop. This giveaway runs through noon on Friday, October 31st. At that time I will close comments on this post and chose a winner using the random number generator at random.org. To be eligible to win your comment must include your favorite coffee shop beverage (be it coffee, tea, chai, whatever). Your comment must lead me back to you via a valid e-mail address or link to your blog; if I don’t have a way to find you, I will chose another winner. The winner will be notified by e-mail or comment on your personal blog Friday afternoon. All names and e-mail addresses collected for this giveaway will be used only for the purpose of notifying the winner of the giveaway. This giveaway is limited to US addresses only (I apologize to any international readers). There are tons more giveaways at the Bloggy Giveaways Quarterly Carnival, be sure to check them out! But if you’re visiting Sidetrack’d for the first time, I’d love for you to stick around for a few minutes and get to know us a little better. Thanks! The great giveaway carnival at Bloggy Giveaways is going on next week. I’m planning to host a giveaway (provided I remember to get something to giveaway), so check back Monday to see what’s going on. And make sure you check out the Bloggy Giveaways site for all sorts of great giveaways. The winner of the “From the Sidetrack’d Bookshelf” giveaway is April of I think I can, I think I can. April, I will be in touch with you by e-mail to get your mailing information. Thanks to everyone who entered. I hope to do another book giveaway during the month of April (timing will depend on Boo at this point), so stay tuned. Thoughtfully penned on March 20th, 2008 and generally concerning Giveaways, Reading, Sidetrack'd, Spring is here! To celebrate Spring and the Spring Reading Thing, Sidetrack’d is hosting a book giveaway! This was a light and fun read that left me with much the same feeling as the books in Jan Karon’s Mitford series. 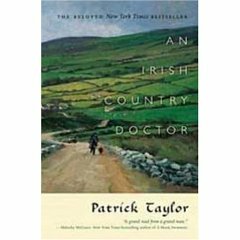 Living in the small, rural Irish town of Ballybucklebo during the mid-twentieth century, the two main characters endear themselves to you with their quirks, faults, and the way they interact with each other and the interesting clients of their medical practice. If you are looking for a warm and happy read, I would recommend you check this one out. Barry Laverty, M.B. can barely find the Northern Ireland village of Ballybucklebo on a map when he first sets out to seek gainful employment there. But Barry jumps at the chance to secure a position as an assistant in a small rural practice. The older physician has his own way of doing things. At first, Barry can’t decide if the pugnacious O’Reilly is the biggest charlatan he has ever met or the best teacher he could ever hope for. Through O’Reilly, Barry soon gets to know all of the village’s colorful and endearing residents and a host of other eccentric characters who make every day an education for the inexperienced young doctor. Ballybucklebo is a long way from Belfast, and Barry is quick to discover that he still has a lot to learn about country life. But with pluck and compassion, and only the slightest touch of blarney, he will find out more about life – and love – than he ever imagined back in medical school. If you would like to be entered in the drawing for this book, leave a comment on this post; you don’t have to be a blogger to win, just be sure to leave a valid e-mail address when you comment. I will close the contest around noon on Friday, March 28, and determine a winner using the random number generator at random.org. The winner will be announced here at Sidetrack’d and notified by e-mail and/or a comment on their personal blog. This is my personal copy of this book, so it has been gently read. I will be happy to ship to US addresses via USPS parcel post or media mail. I hope to have a couple more giveaways during the Spring Reading Thing, so check back over the next several weeks.